Soon after Barney's Farm created Critical Kush, she won the High Times Cannabis Cup. Since then, this feminized seed has been a top choice for the European market. Let's see how she stacks up! As long as you're looking for a photoperiod indica, the numbers alone make Critical Kush hard to resist. She's 100% feminized, 100% indica and capable of pumping out up to 650 gr/m2 of dense, crystal-coated flowers after only 8 weeks (sometimes less) of blooming. Check out the reviews and you'll have dig deep to find anything negative about this Critical Mass X OG Kush cross. That's what convinced us to take this highly sought-after gear out for a spin to see for ourselves if she can live up to her spotless reputation. For us, Critical Kush sprouted fast and grew quickly. She started off short and bushy with big, fat indica-style leaves exactly as we had hoped. By the third week, we topped our young seedlings and gave them another week to recover, then switched our lighting to 12/12 to force bloom. Once put into the flowering stage, our Critical Kush plants had very little stretch, so the final size is very dependent on how long you veg. For us, we ended up with stocky, medium-sized plants about 75 cm tall. The canopy was nice and even and the plants kept their healthy, dark-green colour almost up to harvest. If you decide to give Critical Kush a try, add a support system soon after you go into the flowering stage. We skipped this part because the stems were some of the sturdiest we'd ever seen, but by four and a half weeks into bloom, the branches were starting to bend to the ground from the weight. The buds were super tight, and the resin production was amazing to watch. Combined, these two traits made the flowers surprisingly heavy for their size. During the cure, they hardened up to a rock-like consistency and held most of their weight. We cut some plants right at seven and a half weeks when there was a noticeable fade, and let the rest go all the way to nine to get a higher percentage of amber. There wasn't any noticeable swell after the seven-week mark, so we don't feel like we lost any yield by cutting a few days early. In total, we grew four Critical Kush plants and got between 100 and 150 grams of dried bud off each one, pretty close to the 650 gr/m2 yield that Barney's Farm published. If we'd used a more advanced training technique like SOG, we're fairly sure we could have got even more. If you decide to grow Critical Kush, keep this in mind: when we say the buds are dense, that's no exaggeration. Make sure you clean up even small spills when you're watering and keep a close eye on humidity levels. They seemed hardy enough and we didn't have any problems at all, but carelessness could easily lead to mould or bud rot. When curing, burp your jars often - the same thing can happen if you don’t take care. We misplaced a jar, it didn't get opened properly, and it happened to us. Critical Kush is one of our favourites for a lot of reasons, but flavour and aroma aren't on the list. That's not to say she smells or tastes bad; it's just the one area where this strain doesn't stand out from the crowd. During veg, the young plants have a classic peppery smell if you rub the leaves or disturb the plant. In bloom, Critical Kush emits a citrusy fragrance with clear notes of lemon and lime. Once cured, the aroma and taste are fairly mild. The overall bouquet is raw earth with a spicy edge while the flavour is slightly pungent with touches of wood and more earth. The taste and aroma might be run of the mill, but the powerful stone is far from ordinary. Whether smoked or vaped, Critical Kush takes a few minutes to take effect, then she'll quickly hug your body and your mind in a heavy, thick envelope of pure relaxation. You'll forget about all your problems, let go of any anxiety you've been holding onto, and your muscles will relax and go limp. We won't kid you by saying you won't be able to get up off the couch, but you probably won't want to. 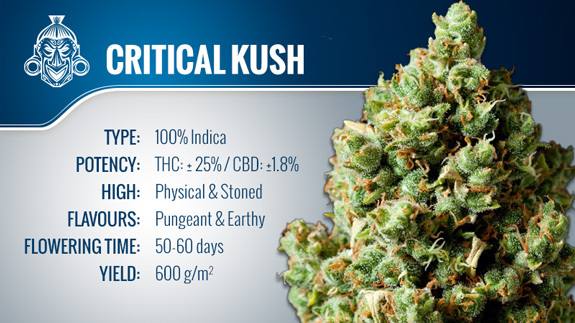 In addition to the high level of THC, Critical Kush has a nice amount of CBD (2.1%) that amplifies the physical buzz. 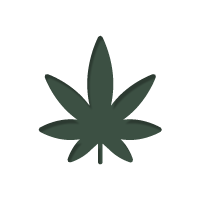 Our smoke report is purely recreational, but it's not hard to see where this strain would have a high potential for medical use if you're looking for better sleep, less pain or stress relief. It is definitely not a wake-and-baker; excessive morning use could ruin your entire day unless that day only involves binge-watching Netflix or playing video games. Critical Kush is a pure indica strain that quickly produces massive yields of beautiful dense buds that look like they were dipped, rolled, then dipped again in shimmering resin crystals. She's fast, beginner-friendly and able to handle just about any mistake you can throw at her while still delivering a potency level that's hard to beat. We would recommend Critical Kush under any condition, but if your stash is running low, she's the perfect choice of cannabis seeds. 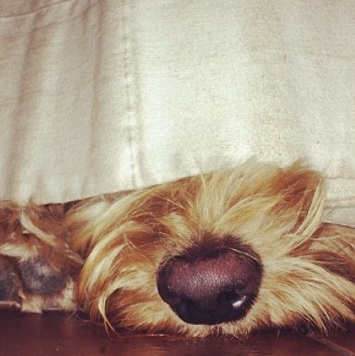 Featuring as a regular guest writer, Laura lives in the wild heart of the American East Coast. Based at her family farm, she has developed a deep respect for cannabis, continuing to master and hone its cultivation.